Prepare an Espresso and let it come to room temperature. Place all ingredients in a bowl and mix them together to a smooth dough without kneading it too much. The dough should just come together. Roll out between 2 freezer bags to a round slightly bigger than your pie dish and let it chill in the fridge for at least 1 hour. 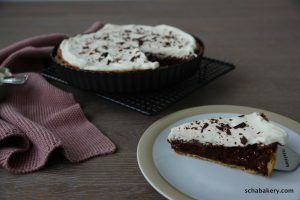 Carefully melt 50 g of chocolate and brush the baked pie crust with it so that the pie crust doesn’t get soggy and remains crisp. Next melt the rest of the chocolate together with the butter over simmering water. Beat the eggs until very fluffy for several minutes before gradually adding the sugar. Keep beating until you get a thick, fluffy mass. Add the chocolate-butter-mixture and only mix to combine, we don’t want it to de-fluff. Sprad into the pie crust and bake for 35 minutes (at 175°C), the filling should remain dense. Let the pie cool on a wire rack and remove it from the tin when cooled completely.